1: What is better in assertaing U seats? KVS Availability tool or ExpertFlyer software? I am not familiar with KVS but I use expertflyer. Expertflyer has recently launched a "notify" service for subscribers on the $9.95 plan. You can select a particular flight and the class you're after, and they will email you if a seat/s becomes available. 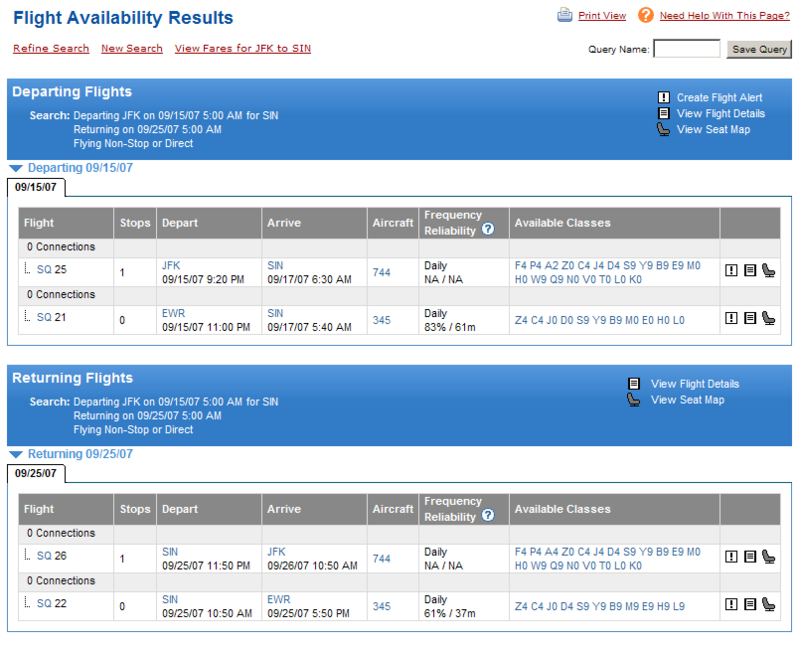 According to expert flyer there are no "U" seats available on either of the three direct flights for that date. Thankyou for the replies. I will look at the Expertflyer program. Lets hope no one buys anymore "J" seats and they let me upgrade in the club. I have clicked on the "Request Upgrade" button about 6 times today. I am not sure how often seat allocations change on QF. On Perth flights, I have never got an upgrade pressing on the button, and I have pressed that button many many times.. Ever got a ODU? I am hoping to. I told my travel agent to book me V so I have a chance at upgrade. Lets hope no one buys anymore "J" seats and they let me upgrade in the club. Don't forget - no "on departure upgrade" with International. All requests must be submitted at least 24 hours before departure. But this flight in question is PER-BNE so I should still have a chance, correct? I've had ODU's and op-up's, just never had any luck with that pesky button And ringing up has never got me anywhere either. Have got ODU's ex Perth often by checking in at QP three hours before the flight, when the seats are made available. Cool, I will try that and then either sit in the lounge or head back out. Also what is an "op-up"? ... Also what is an "op-up"? An "Op Up" is short for "Operational Upgrade". 1) The WHY Cabin is oversold but there is space in J, so to fit all the PAX in some passengers booked in WHY get upgrades to J seating. 2) A flight get cancelled for technical reasons and to reacommodate all the passengers in other flights, spare seats in the J cabins on the other flighs are used for passenger otherwise booked in WHY. Normally, elite Frequent Flyer in the Airline's program get priority for these spare J seats. E.g. For Qantas, this gernally means CL, WP, SG, PS, QP NB, NB in that order. For International flights with Fist Class, this could mean that some J pax are upgraded to first and thier seats are taken by upgraded WHY PAX. Thank you so much for that information serfty! I think WP is Qantas Platinum (Black Card) am I correct? I am guessing the others are plane white membership, Qantas Club, silver, gold etc, but I can not work out what is what. Chairman's Lounge, Wanker Platinum, Scum Gold, Pleb Silver, Qantas Pub Nothing Bronze and Nothing Bronze. Try this thread, for detailed explanations, 7 posts down the list! It is all exciting for me at the moment. I have a meeting with Austrade in the morning looking at gov funding 1 for 1 in relation to expanding my business to SIN. I had budgeted for it with out funding. so with the extra $ it will fly J more often. Can someone tell me how to ger Expertflyer to return results like this? I am burning up my 20 free trial trying to work it out. Log in to Expertflyer. Select Flight Availability. Enter the flight details, such as departing airport, arriving airport, date etc and submit the request. You should get a result that looks like this. The information is under the Available Classes column and can be copied and pasted in the format you show. Never mind, worked it out And there is now more "J" seats available.